TPG Special Contributor Eric Rosen takes us on a quick tour of United.com’s little-known Expert Mode, and how and why you might want to use it to book your next ticket with the airline. When it comes to frequent flyers, one of the things that separates the amateurs from the pros is how closely they pay attention to the booking classes of their ticket. You might think that tickets just come in economy, business and first-class fare buckets. However, each of those is further sub-divided into distinct letter codes designating them as anything from deeply discounted economy all the way up to full-fare first class, not to mention the award-seat fare codes thrown into the mix. 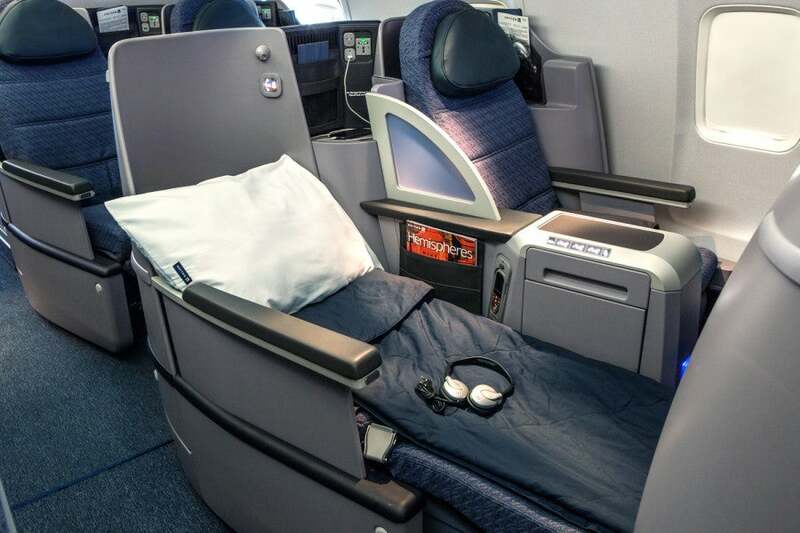 Want to snag an upgrade to United’s BusinessFirst? Using Expert Mode can help. Knowing which fare class your ticket is booked in can be extremely important for a few reasons. First, not all fare classes earn miles the same way, especially with airline partners, and you might earn fewer (or no!) 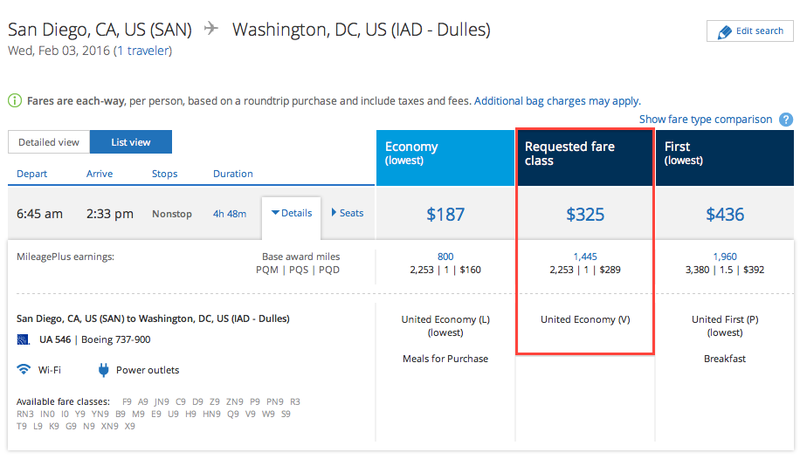 miles with discounted fare classes than full-fare classes. However, more important for most people is finding both award-seat inventory (meaning not just whether there are award seats available on certain flights, but also how many there are), as well as tickets that might be upgradable using miles or United’s elite Premier Upgrades — global, regional, complimentary and new advanced upgrades for United’s top-tier Global Services elites. By knowing which fare classes are available on certain flights, elites and regular MileagePlus members alike can determine their chances of confirming an upgrade, whether award tickets will be available for their whole party and more. That’s especially useful since United pulled its upgrade inventory from ExpertFlyer back in 2013 (though award buckets have since returned), so the best way to figure out the fare situation on your flights is by using United’s own Expert Mode. Now for the easy part. To enable Expert Mode, go to United.com and log in to your MileagePlus account. Click the box next to “I acknowledge these considerations and choose to enable Expert Mode,” and then click save. Then you can go back to United’s homepage and search for flights as usual. Just two things to note here. First, you must be logged in to your account so that Expert Mode is enabled when you perform a flight search. Second, not all browsers will show you all the fare classes. For instance, I use Firefox normally, but I have to use either Chrome or Safari to pull up the individual fare buckets. Now for the complicated part. United has dozens of fare classes and different codes to denote whether there are any and how many seats are available for upgrades on specific flights. First, the upgrades. United has three different upgrade fare “buckets” that denote seats available for upgrades. ON is used for upgrades from business class to first class (on three-cabin aircraft). PN is used to designate upgrades from full-fare Y/B/M tickets to first/business class, plus all Global Services upgrades. R is used for upgrades involving miles or elite certificates, and complimentary upgrades for non-Global Services elites. Next, you’ll need to check United’s Upgrades Overview page, which lists which fare classes are available for which types of upgrades on which routes. So yes, you have to find fares that fulfill those three criteria. For regions with a *, Global Premier Upgrades are not available on flights booked in fare classes Z, P, S, T, K, L, G or N.
For regions with a **, the co-pay is waived for Premier members. All multi-cabin flights operated by Copa Airlines are eligible for Regional Premier Upgrades and Global Premier Upgrades without fare restrictions. Instant upgrades for all Premier members on Y and B full-fare Economy tickets and for Premier 1K members on M fares are available on all flights that are eligible for Complimentary Premier Upgrades. Note that Premier members traveling on full-fare economy Y and discount full-fare economy B fares are eligible for an instant upgrade at time of ticketing on select flights. Premier 1K members traveling on M fares are also eligible for instant upgrades. Instant upgrades are subject to capacity controls. However, remember that if you’re a Premier member booking a Y or B full-fare economy ticket, you also have to know that there’s a PN seat available for that complimentary upgrade on your flight in order to actually get the upgrade. Now for those upgrade certificates. Regional Premier Upgrades (RPUs) and Global Premier Upgrades (GPUs) are elite perks earned when you hit certain levels with MileagePlus. They’re automatically deposited into your account based on the status you earn. You receive two RPUs for reaching Premier Platinum, and another two for hitting Premier 1K, plus an additional two for every 25,000 Premier Qualifying Miles or 30 Premier Qualifying Segments in the calendar year. These certificates are valid through the end of the following program year. You can upgrade from economy to BusinessFirst. You earn six GPUs for hitting 1K and another two for every additional 50,000 Premier Qualifying Miles or 60 Premier Qualifying Segments you fly in the same calendar year. These are also valid until the end of the following program year (end of January). ON to upgrade from business to first class (on three-cabin flights). PN for a Global Services upgrade. R for upgrades one class of service from economy (so business on two- or three-class flights, and first on two-class flights without business class). Just beware that you need to request these upgrades at least 24 hours ahead of your departure, and certain fare classes require a co-pay to upgrade with miles (though some regions waive the co-pay for Premier members). In addition, GPUs can’t be used on most long-haul routes to upgrade a ticket purchased in a deeply discounted fare classes. RPUs can only be used on United, United Express or Copa-operated flights. GPUs may also be used on Lufthansa-operated flights and Lufthansa-operated codeshares marketed by United. However, don’t get your hopes up. There are draconian rules and a lot of horror stories out there about trying to process a GPU on a Lufthansa flight, so it sounds nearly impossible, though there are some reports that the airline’s new online upgrade option has improved the situation slightly. Either way, Lufthansa fare classes not eligible for upgrade include Z, P, V, W, S, T, N, L, K, R, X, I, O, ID, AD and IP. United’s embarrassing 8-across business class. For more information, look at United’s interactive award chart, as well as the GPU and RPU pages. O: United and Star Alliance first-class saver-level award space. I: United and Star Alliance business-class saver-level award space. X: United and Star Alliance economy saver-level award space. There are also IN and XN saver-level awards and FN, JN, ZN, HN and YN standard-level awards for elites and United credit card holders. 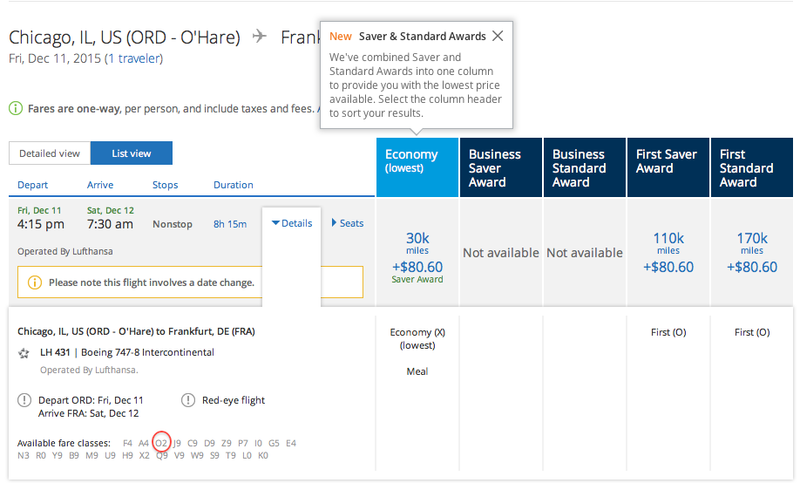 So you can also keep an eye out for those while searching, and that makes it especially useful if you’re searching for multiple award seats on the same flight. Let’s see how all this works on the site. For the most part, you’ll probably be looking for R fares on flights that you can instantly confirm upgrades on rather than putting yourself on the upgrade waitlist and working through the byzantine hierarchy of United’s upgrade priority. So to take a quick example, here’s a flight search from San Diego (SAN) to Washington Dulles (IAD) in February. When the results pull up, click on the Details tab and that will display all the fare classes. On this flight, you’ll notice there are three R-fare tickets, meaning there are three seats you can instantly upgrade from economy to first. You may notice that this search is showing L-fare tickets in discounted economy, which you can upgrade on regional flights. While you don’t need to worry about this for flights within the US, if you’re booking a long-haul international flight be sure to hit “Edit Search” and click on the “Advanced Search” link and type in a fare class that is eligible. There’s a section of the new search page that says you can search by specific fare classes, like W, which you can upgrade on any United-operated route. However, United’s new site is a bit wonky still and this doesn’t pull up the correct results (or any results) all the time, so I’d suggest putting in quite a few of the upgradable fare classes and seeing what populates. In this case, I put in M, Q, V and W.
So as you can see, you book a V fare for $325 as opposed to L for $187. Again, this doesn’t apply to domestic flights, but you’ll probably notice a similar difference on international routes. Now for something a bit grander in scale. Let’s say you want to book a trip to Australia and fly United’s route from Los Angeles to Melbourne on the 787-9 Dreamliner. This is one of the longest routes in the world, clocking in at 15 hours and 50 minutes, so being able to upgrade from coach to business class makes a huge difference. I did a random search in April, and came up with the following United flight where you can see all the available fare classes, including a whopping nine R tickets, meaning there are at least nine seats available to upgrade using your Global Premier or mileage upgrades (plus a co-pay, depending on your fare class). 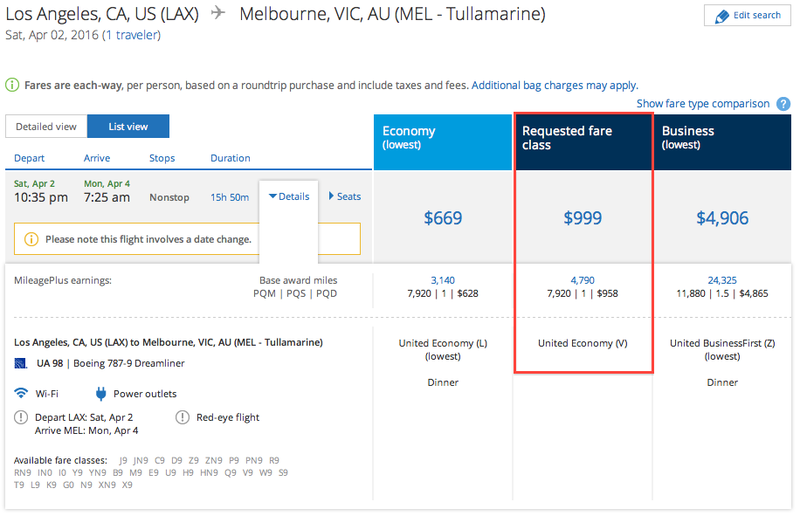 By contrast, United’s flight from LA to Sydney that same day has no R seats available. So what you could do is book an economy ticket and then confirm your upgrade immediately with a Global Premier Upgrade. However, remember that GPUs can’t be used on all fares. 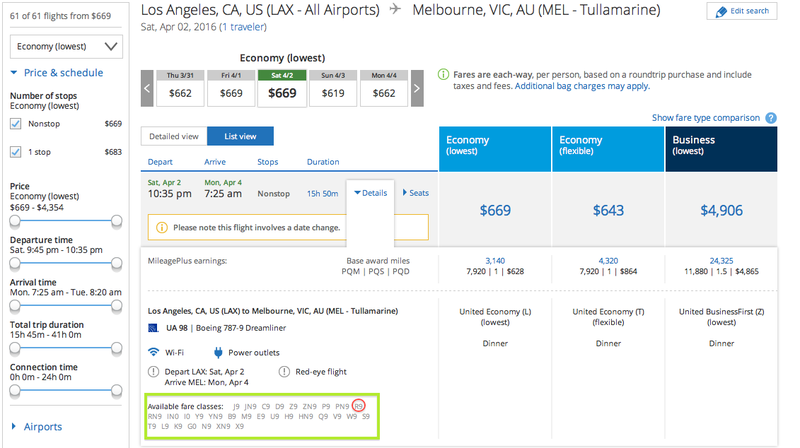 Checking the upgrade chart to Australia, your fare class cannot be P, S, T, K, L, G or N, and the fares displaying here for $669 round-trip are L-class tickets. Instead, I’d have to book a W fare or higher. In order to do that, I went back to the Advanced Search page and put in all the eligible upgradable fare classes and came up with the following results. As you can see, the lowest upgradable fare it pulled is in the V class for $999 round-trip. That’s a $330 premium over discount economy, but still well below the $4,906 a business-class ticket would cost (and remember, this is the one-way price based on a round-trip)! Now for an award-ticket scenario. Let’s say I want to find award tickets on the same flight from Chicago to Frankfurt for two family members traveling together. Of course, I could just put all that info in the search fields normally, but it helps to know exactly what the inventory is like in case you don’t want to book right that moment but want to know the chances of those award seats being around when you’re ready to book. And here’s a flight on another day where there are a whopping nine business-class tickets available! While you might want to book those two first-class tickets ASAP, when it comes to those business-class tickets (because there are nine available) I could see holding off on those. Though United’s Expert Mode isn’t necessary for the majority of flyers just looking for a cheap fare, when it comes to finding award tickets and upgradable tickets, as well as looking at seat inventory and how likely your elite upgrade is to come through, being able to see the fare buckets available on specific flights can be invaluable.